In answer to the oft-repeated slur that pro-lifers care only for the fetus and not for the child beyond the womb, I offer the following as a refreshing break from the weighty subject matter that is regrettably routine on this blog. I’m in my third year of coaching little league baseball, having done so on my son’s team since second grade. We are a parish Catholic Youth Organization (CYO) team, which is to say not nearly so competitive or advanced as a typical little league. We have five boys on the autism spectrum on the team, including my son. As the baseball season is about to begin, we would like to take this opportunity to send you the team schedule and share with you a few thoughts and pointers for making this a great experience for our sons. First, this year will be very different from the boys’ previous experiences. We are now playing regular innings, three strikes, etc. This is usually a difficult adjustment for the batter when called out on strikes, and for the pitcher when he walks eight batters in a row! Of course it would be wonderful if the boys won every game, but realistically, we need to be prepared for a few losses. That preparation begins with understanding why we are here (parish CYO as opposed to Babe Ruth League), and what it is we wish to accomplish. The point of it all is to teach the boys the love of the game, improve their skills, build their self-confidence, and most of all to teach them the value of fair play and good sportsmanship. We coaches need your help with all of this. Some boys will be more advanced than others. Some have been playing longer than others. On this team, every boy plays, and plays frequently! There will be no boy riding the bench. On this team, there will be no superstars and favorites. We coaches pay close attention to each boy at practice and in games, and we find something, no matter how small to praise them about. We ask that you do the same. We will offer gentle correction in order to help the boys learn from mistakes. We will never criticize them. Experience shows that this works best when left to the coaches and left on the field. What the boys need most is PRAISE, PRAISE, PRAISE. Accordingly, we will not tolerate parents ridiculing other children, their own children, other coaches, our coaches or umpires. We have cell phones and the numbers of CYO officials if an umpire shows that he is not up to the job, though that is unlikely. That having been said, CYO has implemented a new program of training and certification for umpires and has fielded the best group of umpires and coaches in its long and impressive history of fostering character formation in our children and those who serve them. If there are any special accommodations your son requires, if there is any special information we need to know to make this a terrific and memorable experience for your son, please don’t hesitate to tell us. In the meantime, we look forward to seeing you at the games and look forward to providing our sons with memories that will last a lifetime. And so it began last year, a perfect season. Zero wins and 15 losses!! Though it was tough to swallow, the boys never complained, cheered one another on, and never, ever quit. Not one! Not even with a 43-0 defeat one game. We coaches agreed that we would never invoke the mercy rule and call a game. We weren’t going to quit on them, and expected them to follow suit. We simply told the boys that the lopsided games were to be treated as great fielding practice. And so it went. 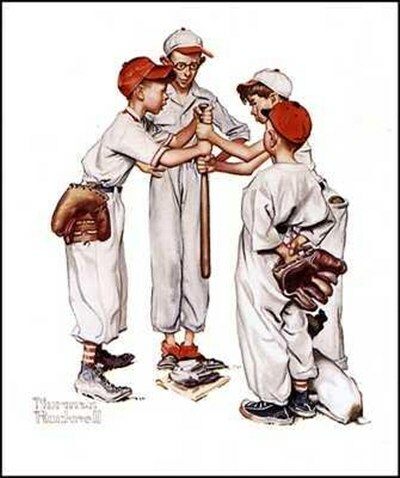 Every boy played every game, and we found something, ANYTHING to praise, even if it was the commanding way the boys swung that bat as they went down on strikes! This year these same boys shut out 2 teams, one of them 20-0. They made the playoffs, and won their first playoff game 13-4 against a team that they tied 3-3 at the beginning of the season. The scores in the lopsided games would have been much higher had we coaches not held the boys back (out of sportsmanship) in base running. Today is the second playoff game, if the rains hold off. It’s been a team effort all the way with parents, kids and coaches. Many dads have pitched in at practices, and we have welcomed all of their input. We coaches have lived that letter to the parents, and the approach has been transformative in the lives of all the boys. More than a few parents have teared up at the sight of their autistic boys being cheered by their teammates, at our sons being embraced and high-fived in the dugout. And when not exhorting batters from my position as third base coach, or leading the cheers, I sometimes find myself being an outside observer of this wondrous sight: Of handicapped boys made less so by dedicated parents and coaches, by peers who welcome them with hearts as wide as the ocean. It’s just one small contribution to building a Culture of Life and a Civilization of Love. The other boys on the team are growing in the realization that there’s a place for everyone at the table, even those shy and otherwise socially hesitant kids like my Joseph who brought two of them around to score with a 2 RBI double, and a triple that turned the tide of their last game. The score of today’s game later this afternoon doesn’t matter. ok who beats another team 43-0? That is simply so unfair and it really says alot about the other team’s coaching. It’s one thing to beat a team but it’s quite another to ground them into the dirt. My son played on a soccer team when he was younger. Because we live in a rural area all the boys play all their sports together – soccer, hockey, lacrosse etc. The result is that any team they form at any level in any sport results in very good team cohesion. Plus these are farm boys who are very physical and are use to playing hard. The boys beat the crap out of one another sometimes but they know who to pass to and when. The result can be devastation to the opposing teams. However, we are blessed with great coaches. Once they get 8 goals up on another team (in soccer, for example), that is it. No more scoring. Instead players get shifted around to different positions to learn new skills etc. And our parents usually end up cheering for the opposing team! It’s easy to say that kids should be able to take losses but it’s darn hard to do if you’re a kid. My eldest daughter played on a soccer team that won a grand total of 5 (FIVE) games over 5 seasons – and most of those came in her last season. She finally had enough and quit at age 15. I felt for her each and every time she lost. Winning games (even a few) goes a long way to making the lessons of good sportsmanship palatable. (We already had a cooler of soda and juices). Parents and children partied for an hour afterward. If the drubbing stung, it didn’t last long. The coaches who wouldn’t quit, who used that game as fielding practice. The jerk coach who had no class and didn’t know when to quit. Yes, the losses were brutally tough to take. But the fathers and coaches held themselves up as men, and our sons followed the example. When we saw every boy return on the first day of spring training, after a 0-15 season, we couldn’t even speak. That’s manhood in ten year-old bodies. They came not only for themselves, but for one another. And they were honored with the fruits of such dedication and perseverance, a season with only three losses. And yes, Joseph was very proud indeed! Thanks. Ladies and Gentleman, have we forgotten Wellington’s remark when asked how he defeated Napoleon? He said it all began on the playing fields of Eton! It is evident you have your coaching skills intact but the 1955 movie ‘The Private War of Major Benson’ is a hoot and a lesson for those unfamiliar with coaching youth sports and attempting to motivate young players. The film contains elemental facets of: preparation and fundamentals; practice then, more practice; adapting to a dynamic environment. All performed under auspices of group effort and fairplay. “It’s easy to have faith in yourself and have discipline when you’re a winner, when you’re number one. What you got to have is faith and discipline when you’re not a winner. This post reminded me of an 8th grade basketball game between two Catholic girls’ teams in 1981. We didn’t have a gym and were only able to practice at the public school on Saturday mornings for a couple hours. We had 6 girls and only one of us resembled anything close to an athlete. We played a full game against a team with over double the girls who practiced almost daily, most of them being natural athletes. Not a fan, player or either coach said much of anything during the game. Silent tears were shed as a few of us fouled out. The other team showed no mercy. We had never heard of a full court press before but we were sure enlightened by the end of this game. We lost 66-0 and that game taught me more about life than the next six years of basketball games combined. It taught me not only who I wanted to be but who I didn’t want to be as well. After the loss, my loving coach let the other coach have it. He did this without raising his voice or using one swear word. We youngsters watched on in amazement. My coach passed away several years ago in a farm accident. His name was Gerald too and he was a wonderful example of a coach and a Catholic husband and father. God Bless and Thanks to all of the Coach Geralds! Oops, I remembered that you are a Gerard not a Gerald. When the name or the game is that close, who’s counting? Thanks Barb. I too had coaches like Gerald. They made me want to emulate them as I grew into adulthood. As for the misspelling, it’s an honor to be thought of along with such a great man! Thanks for sharing him with us today. Yes, some adults simply don’t get it, do they?